Details of our Easter Services. The road layout in Stratford has changed. Please see our vehicle access page for details of how to get in to our car park. Details of regular & upcoming services & teaching series. Newsletter, Concerts, Events & more. Who's who, what's where, rooms available & how to get here. What we believe, Why we believe & What we believe we are called to do. Something for everyone at St. John's. The pipe organ, clock, bells, memorials, etc. Opened in 1834 St. John's has been at the centre of Stratford life for over a century and a half. For information or enquiries about baptisms, weddings, funerals, etc, please contact the Church Office. St. John's is a large, multi-cultural, vibrant, welcoming Church. It is the spiritual home for hundreds of local people, of all ages, races and backgrounds. We enjoy being at the centre of the most exciting corner of London. At St John's we pray daily for God's blessing on Stratford. 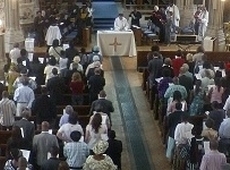 The Church has been an East London landmark, at the centre of the town, since 1834. It's a link with Stratford's past and very much part of Stratford's present. The Church is open every day for prayer, for worship and provides space for community meetings and some great free music. St. John's is fully accessible for wheelchair users and has a soundloop system. The building is well heated and comfortably warm in winter. 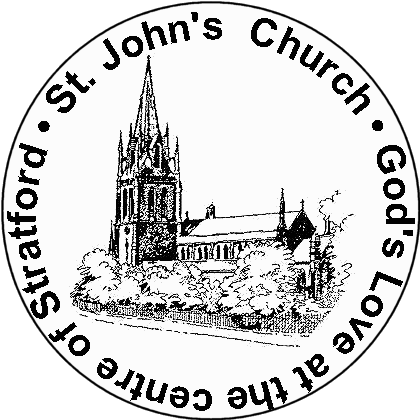 The Parish of Stratford, St. John with Christ Church is a Church of England parish in the Anglican Diocese of Chelmsford, a member of the Evangelical Alliance, Stratford Churches and a Registered Charity, No. 1132176.